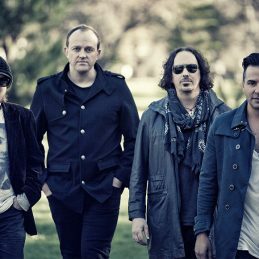 Cutting their teeth on the streets of Melbourne’s eclectic music scene in the late 90’s was the best apprenticeship for four local musicians, Dan Hall, Tim Watson, Tim Wild and Jason Singh. Getting together to write and record a couple of days a week the four members honed their distinctive sound. Upon hearing the band’s demos, Seymour Stein the president of US label Sire Records immediately signed the band…. Cutting their teeth on the streets of Melbourne’s eclectic music scene in the late 90’s was the best apprenticeship for four local musicians, Dan Hall, Tim Watson, Tim Wild and Jason Singh. Getting together to write and record a couple of days a week the four members honed their distinctive sound. Upon hearing the band’s demos, Seymour Stein the president of US label Sire Records immediately signed the band. Stein’s previous signings included Madonna, Talking Heads and The Ramones. four members had in Australia and Internationally. Double platinum number 1 albums, 7 top 40 hit singles including “Get Set’, “Everywhere You Go”, “Creepin’ Up Slowly”, “How I Got This Way”,“Oh Yeah” and an ARIA Award. Worldwide tours throughout the US, Europe, Japan, India, and Australia including the 24/7 nal Tina Turner Tour culminating with two sold out shows at London’s Wembley Stadium. Now in 2015 the original line up is back together. The amazing harmonies, the guitars, the hit songs and the unique sound that was and still is Taxiride are all there in a live show that takes you on a journey to a time where music and songs had meaning and emotion.